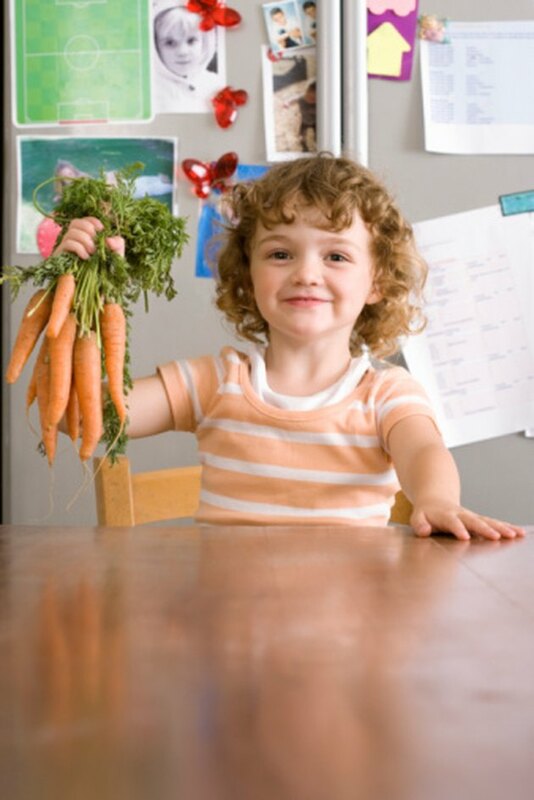 Although carrots are chock full of nutrients, including beta-carotene, potassium and vitamins A and C, kids often turn their nose up at the bright orange vegetables. Often, cooking carrots with ingredients such as cheese or adding a bit of sweetness from honey or brown sugar make carrots more palatable to kids. Small carrots measuring less than 8 inches in length are tender and flavorful. Carrots with a deep orange color provide more beta-carotene. Wash the carrots, and trim off the ends. Leave the peel on small carrots, as the peel is high in nutrients. Peel larger carrots with thicker skin. Cut the carrots into coin shapes, or slice the carrots lengthwise. Place the carrots in a saucepan with about 2 inches water. Bring the water to a boil, then lower the heat to a simmer. Cover the saucepan, then cook for about seven to 10 minutes, depending on the size. The carrots should be firm but tender when you poke them with a fork. Drain the cooked carrots in a colander, then return them to the saucepan. Melt a small amount of butter or margarine in a small saucepan. Stir in the honey or maple syrup, along with cinnamon and a dash of salt. Heat until the mixture forms a thick glaze. Pour the glaze over the carrots. Stir until the carrots are coated with glaze, then serve. Wash the carrots, then trim off the tops and bottoms. Leave the peel on small, tender carrots, or peel larger carrots. Cut the carrots into small pieces. Cook the carrots for seven to 10 minutes -- until they are tender -- in a saucepan filled with simmering water. Place the cooked carrots in a small bowl, then mash the carrots with a fork or potato masher. Grate your child's favorite cheese, and place it in a mixing bowl with the breadcrumbs. Stir to combine. Season the carrot ball mixture to suit your child's preference. If your child likes her food slightly hot, add a small amount of cayenne pepper, red pepper flakes or hot sauce. Otherwise, use a small amount of salt and pepper, or omit the seasonings entirely. Roll the mixture into balls about the size of large walnuts and then in crushed cornflakes or Panko. Coat a baking pan lightly with cooking oil or nonstick cooking spray, and place the carrot balls on the baking pan. Bake the carrot balls for about 30 minutes, or until golden brown. Whole-grain breadcrumbs are healthy, but regular breadcrumbs from white bread can be used if your child doesn't like the flavor or texture of whole grain bread.